When it comes time to install your new roof you should be aware of the type of warranty that comes along with it. Types of warranties vary in length and type from contractor to contractor. There are three common warranties. Obviously, you want your roof warranty to cover everything that could possibly go wrong – so it’s best to read the fine print and be well informed before committing to costly roof installations and renovations. In this post, we will take a look at the different types of warranties and what you should look out for in warranty before deciding on who you get to install your roof. These are warranties that deal with materials from the manufacturer and they can range from a time period of 10 – 30 years depending on the company. The manufacturers’ warranty only covers the materials and does not cover the labour or installation. So if you notice a leak in your roof after installation you have to prove that it’s caused by the materials and if you do you prove causation you will still have to shell out for the labour to fix it. These types of warranties provide very limited coverage and should be avoided or combined with other warranties. A manufacturers’ systems warranty is also issued by the manufacturer and these are very similar to a materials warranty. When purchasing a manufacturers’ system warranty be aware of what is included and excluded. Typically, in a manufacturers’ system warranty, there are a lot of exclusions such as roof repairs to flashings and other roof components. Always ensure you read the fine print to avoid nasty surprises later down the track. Remember your warranty is a legal document and if you go signing for it without understanding the terms and conditions you won’t have any legal legs to stand on. A good roofing company should outline all the terms and conditions with you thoroughly before proceeding with the installation and if they don’t, find one that does to avoid costly repairs in the future. The workmanship guarantee covers the installation and workmanship. They range in length from 1 to 10 years, depending on the contractor and the confidence they have in their skills. This is the best type of warranty as they cover defective materials and installation defects. Again, always review and read the fine print. Make sure you are fully of aware of the inclusions and exclusions before signing anything. 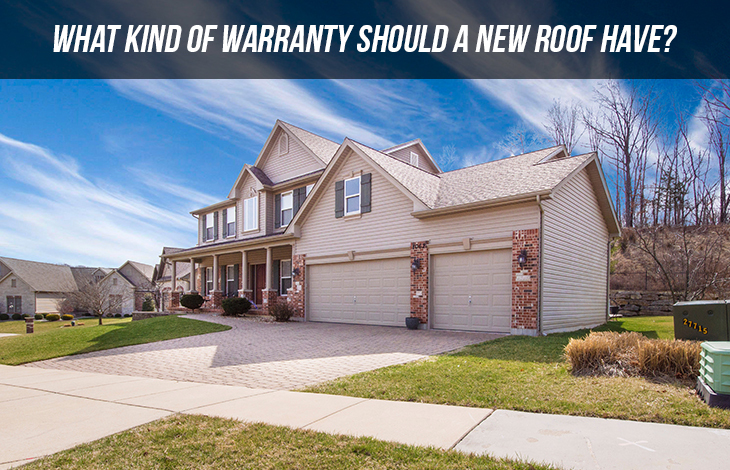 A good roofing warranty should cover defective materials and the workmanship of the contractor. This seems obvious but a lot of warranties out there do not provide this kind of cover. That is why it’s important to sit down with the contractor and discuss exactly what is covered and not covered in your warranty. All roofing components should be covered such as shingles, underlay, venting and the installation itself. Warranties will vary from builder to builder from 1 to 10 years – obviously the longer the better. A good quality roofer will offer a warranty from 7 to 10 years in length. The materials warranty should be longer, anywhere from 10-30 years and they often vary in length from different manufacturers. So when it comes time to choosing materials it often better to go with (generally) more expensive, higher quality manufacturers as they offer a more extensive warranty. You also need to know whether it’s prorated or not. Prorated means that the amount of cover will decrease over time. For example, a 10-year-old roof may only be eligible for 80 percent of the original value. This is quite common, so be aware. Another aspect of the warranty that you need to know is that if the cover is transferable in case you end up selling your house. Your warranty should allow you to transfer the cover to another person at least once. A really good warranty will allow you to transfer the cover multiple times without any hassle. When purchasing your new roof, go over the fine print carefully so you’re getting the maximum coverage for your money. Coverage varies a lot, so shop around and find a contractor and manufacturer that will give you the best coverage available. The roofing industry is rather competitive so doing a little homework will get you a long way in terms of warranty and cover.